What Cars Did Every President Drive? Over the years, we've elected some pretty serious car guys as President of the United States. We've also elected a few whose car choices make you question how they'd be fit to lead this great nation. Regardless of whether you identify yourself as an elephant or a donkey, these are the personal cars of every U.S. President since William Howard Taft—the first president to ever have his own. Taft was the first president with a car, and not coincidentally, the one who ordered the White House stables replaced by a garage. Granted, at over 340 pounds, he was really just doing the horses a favor but he had quite a few vehicles in his time, most notably a Baker Electric Runabout. So, yeah, he’s also the first president to drive an all-electric vehicle. Sorry Elon. Woodrow owned a couple of high dollar rides in his post-presidential years, most notably a Rolls-Royce and a Pierce-Arrow, which in its day held a prestige as mighty as Rolls. The Stevens-Duryea was big, and with prices ranging up to $5,000 back then, it wasn’t exactly cheap. Still, it could hold seven people, and its big ad campaign was that it was “easy on tires,” for whatever that’s worth. Calvin Coolidge: nothingmobile Calvin Coolidge didn’t bother with his own car. He doesn’t get a spot at this table. The Cadillac V-16 is one of the coolest cars in American history, let alone in the annals of presidential rides. A) It was a V-16, and B) it was designed by the legendary Harley Earl, who also gave us the Buick Y-Job and the Corvette. What Coolidge lacked in curb appeal, Hoover made up for it. FDR gets a bit of a pass for not driving his own car, since he kinda couldn't. The Packard 12 was one of the best cars to be driven around in its day. Historically fun sidenote: it was eventually decided that FDR needed an armored car, and for a very brief period while one was being built, the treasury department took Al Capone’s bulletproof Cadillac and used it for a few trips. There are some impressive cars on this list but it’s entirely possible that Truman’s Super Deluxe is the most important. It was the very first car to roll off the assembly line at the end of WWII. Giving it to the president was obviously a purely symbolic gesture, but that doesn’t take anything away from it. Ike had a few cars, but it was the Imperial he favored. It was kinda high-tech when he owned it—the ‘56 Imperial had the first all-transistor radio. To translate that into modern times, think of it as your car automatically signing into Spotify. JFK had an obsession with Thunderbirds. Before taking office he was a GM guy, but once in the White House, he kept requesting more and more T-Birds—Ford even hard a hard time supplying enough for his inauguration, after he requested that more than two dozen be in the parade. LBJ wins the coolest presidential car competition, hands down. He was a true car guy, with dozens of cars to his name, but none with more panache than his Amphicar. He had an affinity for tricking his unsuspecting guests by pretending the brakes were shot and driving straight into a lake. Really. Did Nixon absolutely love his 1950 Olds? Not terribly likely, but he did like to use it to make a political point, as he did in his famous Checkers speech, when he tried to relate to the common voter by announcing what he drove. And that he accepted a dog as a gift. Ford has an enduring public image of a consummate bureaucrat, but after playing football for Michigan in college he went on to have a few fun vehicles ranging from a 1972 Jeep to a 1969 Mustang. Carter wasn’t such an automotive enthusiast, but he did have a 1947 Studebaker as his first car, which, well, at least qualifies him for this list. Reagan owned this BRAT exclusively to ride around on his huge California ranch. The Reagan family gave it away in 1998 and it changed hands a few times before being bought by the group that owns the ranch today. It underwent a painstaking restoration, and is one of the centerpieces today. Wait, another 1947 Studebaker? Note to parents: if you want your kid to do well, you know what to get them as their first ride. Bill’s Mustang was cooler than Ford’s when you stop to think about it, since he didn’t buy it new, he bought it—and drove it—as a classic. He even went on the record, saying that leaving his pride and joy behind was the hardest part about moving into the White House. The rumors in the Triumph enthusiast community are that W.’s Triumph was a graduation present. Regardless, having a Triumph as your first car is seriously on the cool side of things. The Obamas had a Chrysler 300C before switching to the more green Escape Hybrid. And yeah, it’s pretty lame. 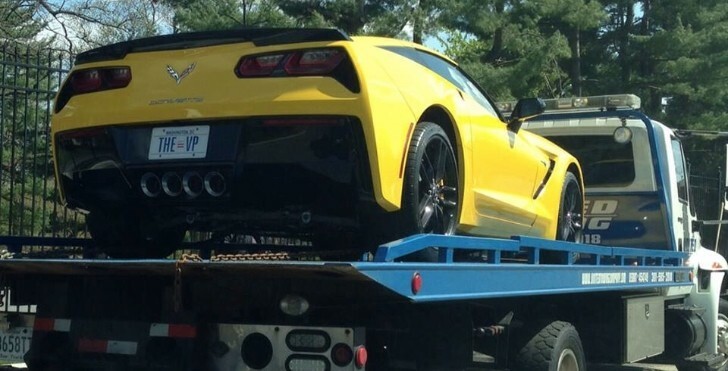 On the plus side, Vice President Biden’s Corvette Stingray has the coolest license plate in the history of license plates, so it um...kinda balances out, right? Not to mention the Onion's Joe Biden has a sweet Trans Am. Aaron Miller is the Rides editor for Supercompressor, and can be found on Twitter. He wishes all presidents were car guys.